Treat your complexion to the Aesop Camellia Nut Facial Hydrating Cream; a rich, deeply nourishing formula that utilises nut and plant extracts to hydrate and protect skin. Infused with a host of beneficial ingredients, including Sandalwood, Chamomile Bud and cold-pressed Macadamia Nut Oil, the quick-absorbing cream delivers long-lasting moisture, without greasy or sticky residue. It provides antioxidant properties to defend against environmental aggressors. Skin feels soft and comfortable with a matte finish and luxurious aroma. 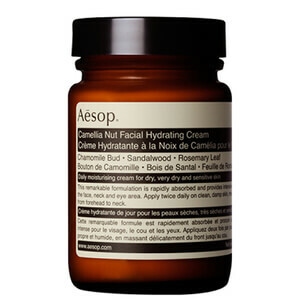 Ideal for normal, dry and sensitive skin. Water (Aqua), Glycerin, Cetearyl Alcohol, Camellia Japonica Seed Oil, Cocos Nucifera (Coconut) Oil, Macadamia Ternifolia Seed Oil, Rosa Canina Fruit Oil, PEG-20 Stearate, Palmitic Acid, Glyceryl Stearate, Steareth-21, Theobroma Cacao (Cocoa) Seed Butter, Phenoxyethanol, Stearic Acid, Coco-Caprylate, Glycine Soja (Soybean) Oil, Fusanus Spicatus Wood Oil, Triticum Vulgare (Wheat) Germ Oil, Ricinus Communis (Castor) Seed Oil, Tocopherol, Lavandula Angustifolia (Lavender) Oil, Rosmarinus Officinalis (Rosemary) Leaf Oil, Hydrogenated Castor Oil, Ormenis Multicaulis Oil, Benzoic Acid, Farnesol, Linalool, Dehydroacetic Acid, Disodium EDTA, Ethylhexylglycerin, Sodium Citrate, Limonene, Aloe Barbadensis Leaf Juice, Beta-Carotene, Daucus Carota Sativa (Carrot) Root Extract.